It seems like there's been a mix up over the recent Oculus Rift and Android pairing, leading many to believe two headsets will be released simultaneously next year. But two different Rifts is now just a dream, with CEO Brandon Iribe setting the record straight by telling Engadget there's actually just one virtual reality headset coming our way. However, the single headset will be able to connect to a PC or laptop and eventually, a mobile device with Android support. Iribe reiterated CTO John Carmack's previous words about the immense power that is needed to run an Android supported headset, but added the team is working to make sure an "earlier chipset" than next-gen Kepler GPUs can be used. If anything, the PC version will be released with a mobile update following launch, unless everything can be finished at the same time. The reality of an untethered experience is another lost feature bursting bubbles. 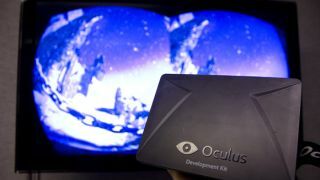 Untethered Oculus Rifts will actually be a long ways down the road - Iribe explained that the experience will continue to remain tethered both to PC and mobile devices for the needed computing power. The company is focusing on one aspect at a time, and at the moment, Android optimization for use on mobile is an the the top of the list. However, a semi-untethered experience is a major part of the project's future. Iribe and team all share the same vision for a standalone Oculus that provides the "option of plugging into an external computing device with a wire" with the ability to seamlessly move between devices. Look for the Oculus Rift to hit homes in 2014, though you can count on more demos from the company until then, probably at CES 2014. No VR set for the holidays this year, but we have plenty of other gift ideas here!